A bit of a joke here, not a funny joke, but more like I had gotten some white oak that was unbelievably scraggly and bent, cracked, very difficult to bring to any fine place. Very well then, I had to bring it where it wanted to go. 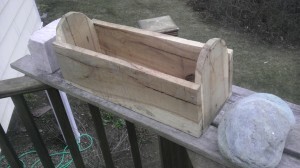 Tombstone planter. Actually I broke my own rules on this one inasmuch as I had not used a nail or a screw in this boxes series. Here there was no fineness to preserve – it was about affixing the pieces together. One of the tombstone end pieces split as I was nearing completion – had to add glue and a clever array of clamps to rescue from pure failure. 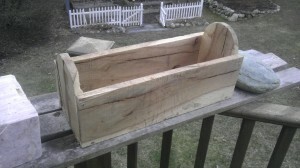 This entry was posted in Boxes, Making Things by prd. Bookmark the permalink.